Places tolerance symbols in drawings. 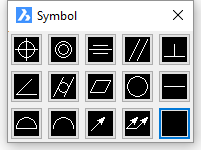 Note: Tolerance symbols are also placed by the QLeader command. Value - specifies the datum value. Material condition - click to display the Material Condition dialog box. Specifies the height of the tolerance symbols. Specifies datum indentifier, such as Datum A. At maximum material condition (MMC), a feature contains the maximum amount of material stated in the limits. At least material condition (LMC), a feature contains the minimum amount of material stated in the limits. Regardless of feature size (RFS) indicates that the feature can be any size within the stated limits. Select the tolerance. Notice that it has one grip. Drag the grip to move the tolerance. Leader - attaches tolerances to leader lines. DimOrdinate - draws x and y ordinate dimensions.